Of the three main adventure racing disciplines — orienteering, paddling, and mountain biking — it’s the last that can be the biggest barrier for beginners. While orienteering takes practice, a team only needs one navigator (teammates who can share the navigational duties and give input on route selection are a huge help), and pairing up with a more experienced partner can help paddling newbies. On the bike leg, though, it’s all you: no one can ride your bike for you. On my Facebook page I get more emails about learning to mountain bike than about any other part of adventure racing, and because I’m fairly new to it myself I have some tips on mountain biking to help you to get started. A mountain bike has been required gear for ever adventure race I’ve done or read about, so the first thing you need is a bike. Don’t run right out and buy one, though; start by doing research. The number of details and different brands and components and variables are mind-boggling. Test ride a lot of bikes. This will give you a chance to see what feels and fits the best for you. Good to know: You’re not just shopping for a bike but also for a bike shop. You’re going to need them for parts, labor, gear, and advice. Buy from a shop you’re going to be happy returning to. The best thing you can do is pick the brain of more experienced riders to help narrow down some priorities. With bikes, to a large degree, you get what you pay for. No bike will do the work for you, but better components can certainly make for a better riding experience. That said, you don’t need the Cadillac of bikes to get started. Go with what you can afford and upgrade later. My base model Specialized has done everything I’ve asked it to do, and when I upgrade I’ll appreciate the new bike that much more. Riding with friends is way more fun than riding alone. 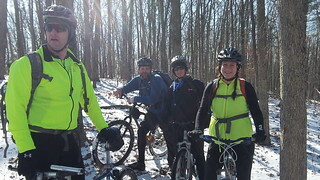 Group rides are another way to have fun, get practice, and gain experience. As a new rider, make sure to seek out no-drop rides. There’s nothing so disheartening as heading out with a big group only to get left in the dust. Don’t feel that you have to go long distances; riding loops of the same trail can help improve your skills and comfort level as you practice different lines and recognize what works best for you. Good to know: Start with beginner-friendly trails and then branch out to other trails as your confidence and skill level increase. Once you’ve gained some trail experience, you’ll want to work on discrete skills. Being able to ride over obstacles in the trail, navigate switchbacks, and ride skinny sections are all going to come in handy. Because all race directors are sadists, you’re almost certain to encounter hills; climbing and descending skills are mandatory. Mountain biking books and YouTube videos abound, but there’s nothing like having someone there to give you advice and feedback. Recruit a friend, find a segment of trail where you can practice a designated skill, and ride it over and over again. Good to know: You can practice in your back yard, too. Throw a small log on the ground and practice riding over it. Lay out a 2x4 and ride on it. Toss out some obstacles and weave around them. Another way to build skills is to get professional help. In the St. Louis area, Team Revolution hosts a variety of bike clinics throughout the year; their mountain bike clinic is particularly valuable. 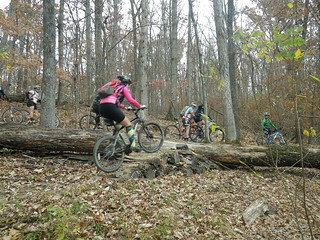 Another resource for women is the Midwest Women’s Mountain Bike Clinic in Brown County, IN. A more expensive alternative is offered through BetterRide.net, which hosts mountain bike clinics throughout the country. A quick google search will help you find even more options. 1) You’ll often be surprised by how little singletrack you’ll see in many adventure races. 2) There’s no law that says you have to ride everything. If you come to something you aren’t comfortable with, walk it. There’s no shame in knowing your limits…and great joy in watching as they expand. What helped you when you were learning to mountain bike? Or, if you’re a new or aspiring rider, what questions or concerns do you have?